SB Train on Junction Yard Running Track stopped, waiting to cross Pleasant St by CP YD. NS engine, can't see ID number yet. Make that NS 5011. RR-32. Second shift Lincoln Secondary job returning from Brownstown. Thanks, ConrailDetroit. It's always nice to to find out the names of these trains and where they're from/headed. Maybe if I got one of those scanners I could figure out some of that info myself. NB NS 8400 and 9906 (if I remember correctly) just pulled their train right up to Delray on the Detroit line, then backed up over the drawbridge back toward CP YD. A train with 3 NS engines did this yesterday evening also. 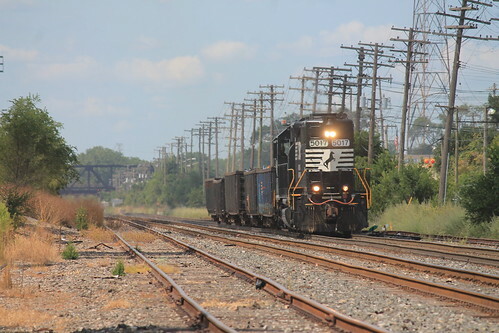 Is this a common way to enter the Conrail River Rouge yard? Wow! Just saw three young boys crawl under a tanker car CBTX 784374--with their bikes--of the above train while it was stopped at Pleasant St. Never seen that before. A whole new level of stupid! blueheron13 wrote: Wow! Just saw three young boys crawl under a tanker car CBTX 784374--with their bikes--of the above train while it was stopped at Pleasant St. Never seen that before. A whole new level of stupid! Stick around , you'll see a kinds of stupid ( Visger and Salliotte crossings are both hot spots for stupidity ! ). A few years back the RR 40 on their way to Lincoln yard killed a guy and his bicycle there. He climbed through their stopped train. Didn't workout for him. blueheron13 wrote: NB NS 8400 and 9906 (if I remember correctly) just pulled their train right up to Delray on the Detroit line, then backed up over the drawbridge back toward CP YD. A train with 3 NS engines did this yesterday evening also. 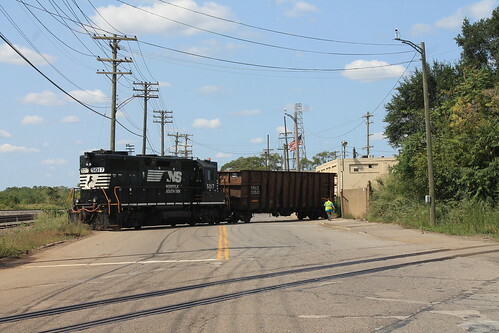 Is this a common way to enter the Conrail River Rouge yard? NS 332 setting cars off at the Rouge. After they are done they go around the junction runner to Oakwood. Trenton 5 ( RR98), NS 5011 returned to the Rouge around 9pm with 4 Covered Hoppers from St Marys, 1 boxcar from MPI, CSX Shove Platform, 4 tankers from Jones. LV-4, CSX 4401? Switching PVS at Joy Rd on Terminal West. Tankers and covered hoppers were in their consist. At Delray UP 4765 and 4384 leading train from NS Detroit District on to NB Conrail tracks. blueheron13 wrote: At Delray UP 4765 and 4384 leading train from NS Detroit District on to NB Conrail tracks. NS 176. 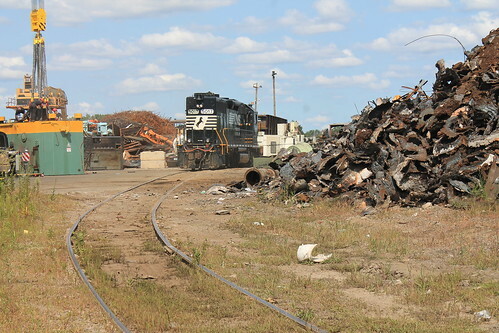 Leaves Oakwood around 4-7pm and drops cars at Conrail's eastside yards and terminates at Sterling. Engines return on the NS 171 which leaves Sterling around 2am. UP engines are common as 171 terminates on the UP in Salem. Thanks I was wondering where that train was heading! Love being stuck between two trains at Delray: NB CN just cleared on Conrail tracks, meanwhile what is probably a CSX Intermodal is finally moving NB on to the Old Main after blocking Dearborn St for at least 20 minutes with the rear end stopped in the way of the road. 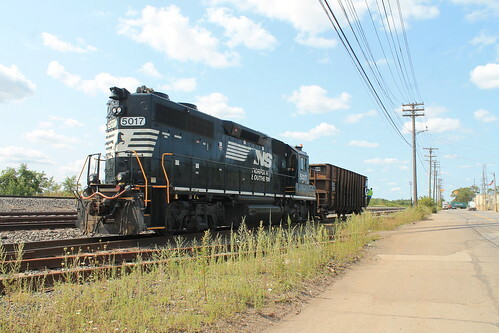 NS 5018 leading train SB at CP YD off of Junction Yard Running Track. Boxcar at Metro Alloys on Terminal West at Ryan Rd. First time ever seeing a car there. 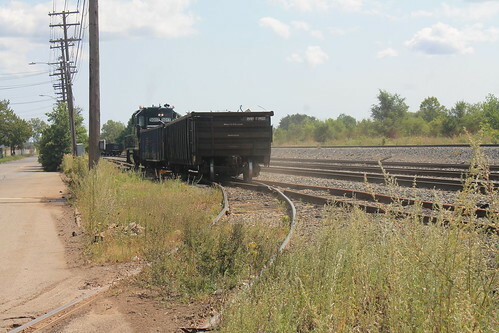 NY-7 approaching Mack Yard with Autoracks. LV-4 or LV-6 switching Ferrous Scrap on John Kronk. They went in wide one empty high wide and came out with 2 loaded gons. NY-21, NS 9531 running 41 cars up to Sterling from Mack Yard. NY-28, NS 5219 brought back 6 Autoracks from GM Poletown. LV-35, CSX 4401. After switching the Coker, LV-35 shoved north on the runner with the Shove platform to the Michigan Line, then pulled forward to Livernois with 6 tankers. WS-11, NS 5226 filled the Chrysler docks at Sterling with empty autoracks and then went to deliver 1 Boxcar to Ford Axle.